They say the Cornish pastry in those days was so hard that it could be dropped down a mine shaft without breaking as the people used the cheaper barley flour instead of wheat in the pastry. I felt buoyed by the fact that our lawmakers from both sides of the aisle have displayed significantly greater maturity by adopting the ground-breaking approach of speaking with one voice rather than the unyielding partisanship of voting along party line on major issues affecting the well-being of the state. It is seen as a thaw – albeit a nascent defrost but, nonetheless, quite notable given its rarity – in the often rigid “us or them” faceoff in the State Assembly. Indeed, Christmas is about the gift of love packaged in joy, peace, hope and faith and no less important, an alacritous readiness, crucially at the legislative level, to stand together and fight for the common good for Fairland Sarawak. Christmas also means family. And family means parents, children, siblings, uncles and aunties. We all have one, two or three of them, if not all of them. Invariably, Christmas will not be complete without family. Amidst the slew of good news, there was, however, some bad news. Last weekend, Sarawakians grieved over yet another coal-mine blast – in two years. In an underground explosion 69m inside a tunnel of the Selantik coalmine at Bukit Bagunan, Sri Aman, three workers lost their lives on the spot while a fourth one died on Tuesday. The dead were identified as Tun Tun Win from Myanmar, Pang Chung Hyok from North Korea and Mardianto from Indonesia. The fourth victim was Acmad Zidin also an Indonesian. All the victims had families – they were loved by many who called them fathers, sons, brothers or uncles, not to mention friends. Likewise, the 30 odd workers who were injured with some in critical condition are dear to many. The sorrow of their families is felt by Sarawakians, known for their care, and warmth and hospitality – whether among fellow anak Sarawak or to foreigners working here. According to initial reports, the incident was caused by sparks from a faulty fan inside the gas-filled tunnel which ignited the explosion and also fire to the under-ground tunnel. Do we really understand the nature of these coal miners’ work? What is it like? How are their working conditions and environment? Have they been treated well and with dignity, their health and safety prioritised at their workplace? Have law enforcement conducted regular checks on the mine – whether the operators are complying with standard guidelines on safety measures? Working over 100 metres underground – it’s scary just to think about it, especially when the work is done in the absence of standard safety measures. These and many other questions have not been answered. Only the authorities and the coal mine owners can shed light on them. Two years ago, I was in Moonta, a town on the Yorke Peninsula of South Australia, about 165km from the state capital of Adelaide. I had a glimpse of a miner’s life when I visited the Moonta Mines Museum. Here, there are 14 rooms to look through to learn about the lifestyles of the Cornish miners – what they did, how they lived, their hardships, their families, their school life, their work in the mines, their life underground and even their last journey to their resting ground. A walk through this school-turned-museum convinced me of this truth – that the Cornish people lived life to the full because they knew a miner’s life could be short. And when the mines stop operating, they left behind a beautiful small town for a close-knit community with streets full of original cottages, an old railway station, opened in 1909, the Moonta Uniting Church (once a Methodist Church), built in 1873, and the Moonta Methodist Church, built in 1865. 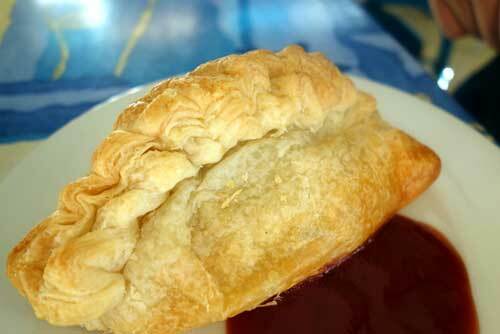 Before driving through Moonta, I had breakfast at one of the cafés and ordered a Cornish pastry. It was of unique shape with a big handle. And I wondered why. Soon, I was to find out at the Moonta Mines Museum that the crust of Cornish pastries was made into a fairly large handle so that the miners and farm workers could hold their pastries in their unwashed hands and not eat any of the dirt! In a mine, dirt could contain tin, copper and arsenic dust – all poisonous. The miners worked hundreds of metres under the ground where there was no water to wash their hands. To avoid transferring toxic waste from their hands onto their food, they would hold a pastry by the rim, eat the rest of it and then throw the rim away. Or are they just slogging it out and hoping to earn their keep and return home one day soon? These workers are staying in the Iban heartland of Bukit Begunan. No kimchi for the Koreans but do they find the local kasam a close equivalent to home? Historically, Moonta has been made home by a community of Cornish miners … and it’s beautiful – the county, the grand church and the bay houses. They have built a legacy – a Cornwall home away from home. “The appearance of the Moonta Mines is decidedly attractive. They are so clean on top and all the machinery look so bright and well kept. “The manager’s house is quite a man-sion, and the captain or sub-manager’s house in the vicinity looked decidedly comfortable – also the miners’ houses. One small row of miners’ dwellings is called Ballarat Row. “A splendid new institute has recently been built with an extra fine library, for the majority of the Moonta miners are anything but uncouth workmen. They are reading and thoughtful men, and I was quite astonished at the class of reading materials on the bookshelves. “The miners had several lodges and their own special doctor, living in a nice cottage close to the mine.” But what will we have at Bukit Bagunan when the miners leave? A haunting grave and a land of devastation? If there is any consolation, it is the government’s positive response to the call by Land Development Minister Tan Sri Datuk Amar Dr James Jemut Masing and Batu Lintang assemblyman See Chee How for an independent investigation to determine the cause of the explosion and recommend ways to make coal mines safe. Meanwhile, let our thoughts and prayers be with the families of the victims. It’s very the least we can do as the Yuletide Season draws nigh.